with rnetallic touch mek : essentials _Metallic geometrie inserts. Inserti geometrici metallizzati. _Contemporary gold accents. Accenti dorati contemporanei. _Three-dimensional wall decorations. Tridimensionalità decorative a parete. 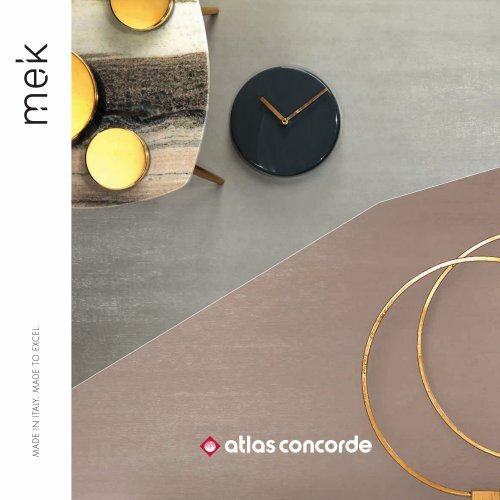 MEK : D E CO R AT I V E ST Y L E An elegant decor finish for commercial and residential interiors is characterized by an extensive selection of decorations, embellished with geometric hints of metal and original three-dimensional wall tiles. UNA FINITURA D’ARREDO RAFFINATA PER INTERNI COMMERCIALI E RESIDENZIALI È CARATTERIZZATA DA UN AMPIO APPARATO DECORATIVO, IMPREZIOSITO DA GEOMETRIE RICCHE DI SUGGESTIONI METALLIZZATE E DA TRIDIMENSIONALITÀ ORIGINALI A PARETE.